I'm finally done with the Blodthirster Bloodbath formation project. It's taken me a few months to get the whole thing done, but it looks absolutely stunning when you set all the models together on the table. I get to use the army in an upcoming game (battle report coming!) before I give it over to my friend... I want him to know what it's like to face off against it and besides, when am I ever going to get to use an army like this again? It comes in right around 3000 points for 8 models for those who are wondering. 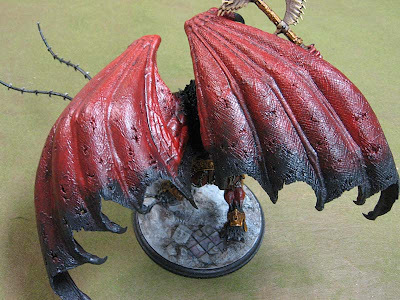 This post just has some shots of the finished Forge World Bloodthirster. I'll be getting some pics of the other seven come battle time. This one is tough to photograph since he's such a large model, so I have some pics of different areas of him. It's the best I can do with my limited skills and equipment. Enjoy. This guy is huge compared to everything else on the table. I borrowed a 25mm based model from someone playing on another table to give you an idea of his sheer size. He sits on a 5.5 inch (about 120mm I think)round base. I'm getting better at my "marble" technique. Here's how I built the bases for the whole force and how I painted them as well. I went with the grey, urban scheme for two reasons. First, my friend wanted them painted that way and they're his models. That one's a no-brainer. Second, the cool, light value greys make for a nice contrast to the warm, dark reds on the model and really make it pop. I'm a big advocate of using your base to make your model stand out and really create a feeling to your army. The wings are simple. They fade to black as you get to the bottom to make them look a little worn torn and weathered. I kept the majority of the wing red since I didn't want the model ending up more black than red. 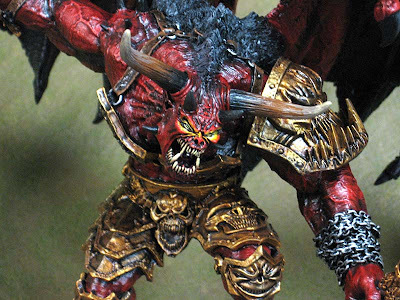 I have a couple smaller Bloodthirsters that are more black than red and while it makes for a bit of variety, red is the color of Khorne. I started with a basecoat of red, added a series of washes to darken it and kept adding layers towards the bottom of the wings until I got them to straight black. Then I went in and highlighted the tips of the wings with a couple lighter shades of red and used grey to highlight the bottoms. The wings are pinned in two places which makes them removable for transportation. Both hands are pinned as well so the whip and axe can be taken off. This guy would be too big to transport any other way honestly. Here's his axe. I don't have a pic of his whip since there's nothing really to see with it. 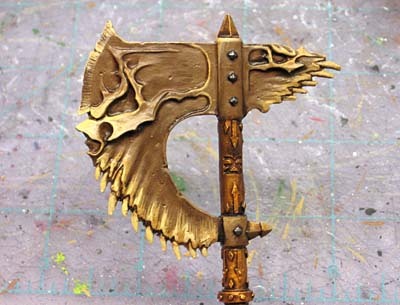 The axe though has been painted to look like bone. This is the only "bone" weapon in the formation. The rest of the models have metal or black blades. I painted this by starting with a medium brown color and washing it with Devlan Mud. Then I went back with the original color and started working up the highlights. I kept adding lighter and lighter shades until I got to a real light bone color along the edge. I used a series of short, straight brush strokes that I left visible to add some texture to the surface of the weapon. And a close up shot of his torso. 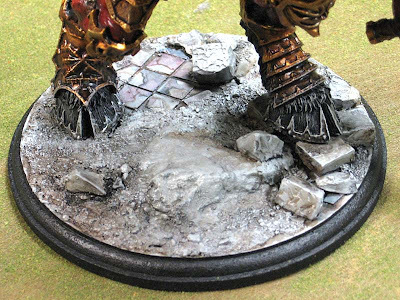 The gold is done by starting with GW Shining Gold and adding a series of Devlan Mud washes along with Black in the recessed areas. Then I go back and highlight (light drybrush along the edges and upper surfaces) with a metal color and then wash with Gryphonne Sepia. Then a final highlight of gold mixed with silver along the very edges and upper parts of the armour plates. The horns are four browns and black. Each one covering slightly less of the horn. I started by painting the entire thing the lightest color and kept working my way back towards his head. It's just a series of straight brush strokes with a little space between each one. His skin is painted similar to how I did my Space Hulk terminators. I started with a red, washed it with Baal Red, Devlan Mud (thinned) and then one more coat of Baal Red. I went in with Black to define the recessed areas on this guy. Since he has so much texture on his skin, I carefully drybrushed some of the areas by starting with the original red and slowly adding a light orangish-tan color to the mix to add contrast to his face. The face took a few minutes to get the right look. I painted it "normal" at first and then saw a picture of this guy in Imperial Armour Seven with glowing eyes and thought it would be a cool effect to duplicate. I tried to make sure I kept the lighting consistent on his face and started by adding orange to his eyes and cheeks. From there I worked up to yellow and then white on his eyes. At first, I had too much "glow" so I went back in with red and toned down the edges and closed everything in a little bit. It's only his eyes that are glowing, it's not like he has some high powered spotlights mounted to his forehead. And that's it for this project. I'll post some battle report picture in the coming weeks along with some shots of his guy's seven little brothers. You were absolutely correct, and the toned-down eyes look tremendous. Also, I'm particularly taken with the axe. Beautiful work. This is a real display piece. Biblical ... simply biblical work Ron. The eye's in particular really sell this piece. Lovely forgeworld work and a worthy completed job - well done! Absolutely gorgeous Ron! It seems to me that painting a model of that size is very different from the smaller ones I'm used to working on, as far as applying shading and highlights, but you've done a fantastic job. It turned out extremely menacing. Keep up the great work! Beautiful work. I agree about the eyes, they're just right, just enough glow to be menacing. The armor turned out nicely -- I may use that recipe for my Vostroyans. Wow...I've really wanted to get the whole set of 4 greater daemons from Forgeworld, but my painting skills just aren't there to make it worth while yet. I really appreciate the detail you go into about your method. 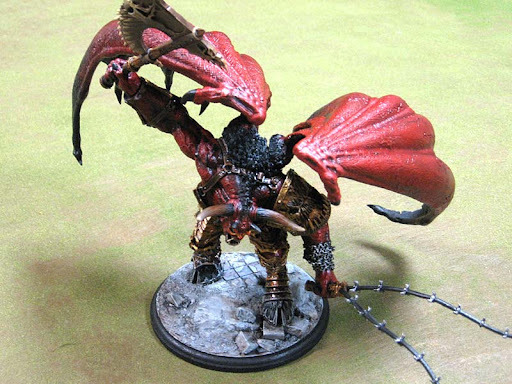 I think I'm going to try to duplicate it on my much neglected Skulltaker, and maybe even Bloodthirster, this evening. Thanks guys. All in all, he took a day to paint, he matches the other seven in the formation and my friend should be happy with it (hopefully). I thought I might have ome trouble scaling up my painting for the larger model, but it turned out to be nothing... I just used bigger brushes and then went back spending more time on the smaller details. Excellent job!!! Seriously, this is great work. The wings looks great - the way that the red blends in to the black is brilliant. And the face - my word - that is a true expression of Khorne if ever I saw one. Im scared...there will be many dead in his wake. Ye Gods, he's a big 'un! Excellent work, particularly the face. I think you did an excellent job. The eyes came out great and have a good contrast going on compared to the red. That is simply amazing. It looks like art lifted directly from the books. Top notch. Great job. I want to see this guy with his retinue, ready to collect skulls for Khorne! I've borrowed the gold technique for the gold bits on a High Elf mini (Korhil), and it is fantastic. Definitely my new way of painting gold from now on. 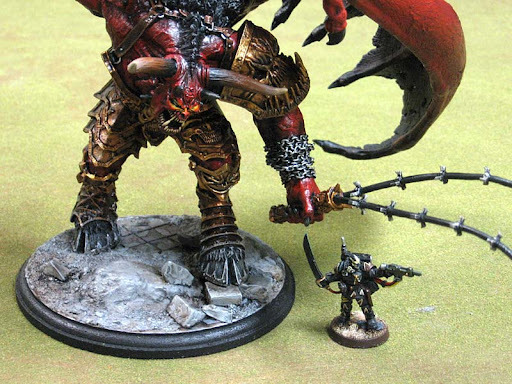 I read the basing tutorial... but where did you get the actual base for this big guy? Does it come from Forgeworld? I've got some big stuff in the works for an Apoc list, (like a Giant Spined Chaos Beast) and I'm using an old CD as a stand-in base for now... but I like the beveled edge on yours. Consadine: Glad to hear it helped and worked out for you. Mr. Esty: Sorry about that, it's from a local craft store (Michael's). It's a 5.5 inch round MDF (that's the material) base. They come in all kinds of sizes and shapes and this is the closest I could get to the 5 inch square base he comes with. What base did you use for An'ggrath? Anon: His base is from a local craft store (Michael's). It's a 5.5 inch round MDF (that's the material) base. They come in all kinds of sizes and shapes and this is the closest I could get to the 5 inch square base he comes with. thanks for the quick reply Ron,i dont think i said last time how much i liked the paint job on the models, they're really great. p.s did you have any problems joining An'ggraths torso to his legs? as the moulding on mine does not match...i am considering filling the gap with greenstuff to get a neat join, and then triple pinning it for strength. how would you go about the problem.thanks..
oh, i nearly forgot, what undercoat did you use, as i cannot find any resin friendly ones at the moment, i recently learn't that the gw chaos black doesn't work, as the paint on my world eaters dreadnought has started falling off. i know forgeworld says to use a resin friendly undercoat, but i assumed that the gw one would be fine. if you could reply it would be greatly appreciated. thanks again. Anon: Thanks! At the end of the post is a link to all the posts about the project. There might be something in there to help. 1. The base cost me a couple dollars. That was for the blank piece of MDF. I added all the elements to it later on. 2. Joining his legs... I don't remember them giving me much problem. I think I pinned them in place, but I don't remember honestly. I'm certain I did, I can't imagine not doing it. 3. The undercoat is cheap primer paint I bought from Walmart (light grey in color). The key to getting any paint to stick to resin well enough is cleaning the model with warm, soapy water. Getting any oils and release agent off the resin is key to getting the paint to adhere properly. Hope this helps and thanks for the questions! cheers again ron,thanks for teling me about the link, the other posts are really helpful. this is proving to be one of my favourite websites thanks to you ron, top notch. Anon: Thanks for the kind words!